Donald Trump may be also violating the domestic emoluments clause. The Trump SoHo building in New York City. Ethics watchdogs and good-government types were quick to sound the alarm over Donald Trump’s apparent violation of the Foreign Emoluments Clause. Even before Trump was sworn in, experts were warning that his continued ownership of his business empire meant that he’d be accepting payments from foreign governments in violation of the U.S. Constitution. These could come in the form of payments for hotel stays by foreign diplomats, lease payments for office space from foreign state-controlled businesses, or any number of other ways. The issue is at the center of the first—and to date, most high profile—legal challenge to the president’s continued ownership of his for-profit business. 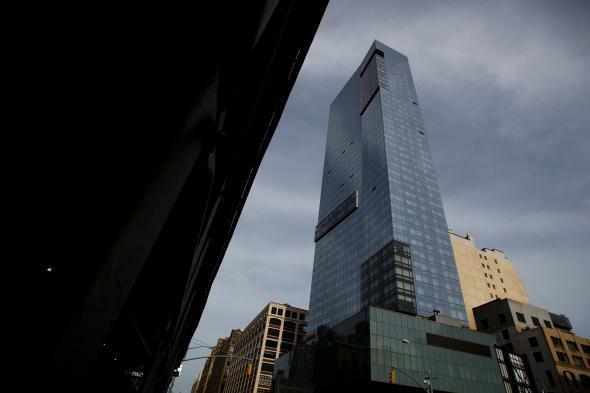 The Trump SoHo Hotel and Condominium in Manhattan is an upscale 46-story property owned by a Los Angeles investment group, the CIM Group, through one of its real estate funds. The possible problem for Trump lies in the fact that state- and city-run pension funds have invested in the CIM fund and pay it a few million dollars in quarterly fees to manage their investments in its portfolio, which includes the Trump SoHo, according to state investment records. The payment flow chart is a little complicated—as is usually the case given the nesting doll of LLCs and trusts that make up the Trump Organization—but it boils down to this: State or city-run pension funds in California, New York, Texas, Arizona, Montana, Michigan, and Missouri pay millions of dollars per quarter to CIM, which then turns around and pays a portion of that money via a subsidiary to a pair of Trump-owned companies to manage, market, and operate the SoHo hotel. According to the most recent publicly available numbers, the Trump-owned businesses bring in an estimated $9 million a year from the CIM deal. The Domestic Emoluments Clause differs from its foreign counterpart in at least two important ways beyond where the emolument is coming from. First, while the foreign clause covers all office holders, the domestic one is focused exclusively on the chief executive. Second, while the Constitution allows Congress to make exceptions for some foreign emoluments, there’s no such loophole for domestic ones. The rationale for including the domestic clause was to prevent a state—or even Congress—from buying a favor from the president. The fact the framers felt it necessary to include two different emoluments clauses should tell you how serious of a concern they thought this was. In this case, the fear would be that other states might invest in this fund—or some other one that also does business with Trump—in order to gain Trump’s favor, or even avoid his ire. Still, this might not be an open-and-shut case. As with foreign emoluments, there is the question of standing for any legal challenge. And as we saw with the convoluted workaround Trump found to maintain his government lease for his D.C. hotel, it’s possible the president can carve out some wiggle room if he were to restructure his company in a way where he did not receive any of the cash while still in office. It will ultimately come down to how broadly a court is willing to interpret a clause with little precedent. As Brianne Gorod, chief counsel at the Constitutional Accountability Center, a Washington public advocacy law firm, put it to Reuters: “We’re in largely uncharted territory… given that past presidents have gone to great lengths to avoid the kinds of issues we’re now confronting.” Trump, however, appears content to sail headlong into them. Know anything about a potential conflict of interest in the Trump administration? DM Josh Voorhees on Twitter, or email him at josh.voorhees@slate.com.